A seasonal space on a lobstering island becomes an energy-efficient, storage-conscious home with respect for local architecture. 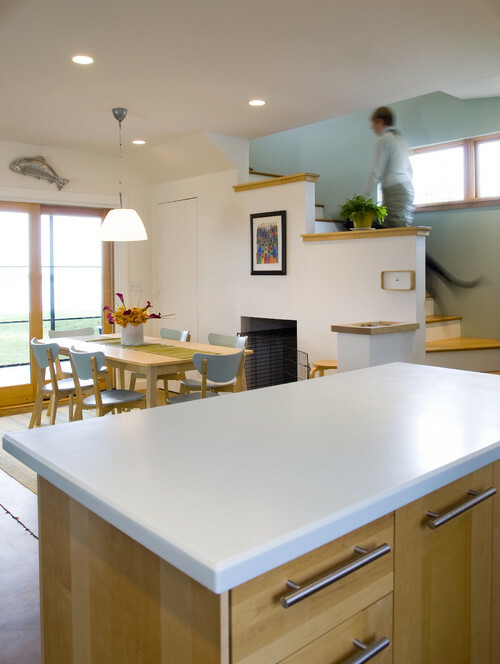 An energy-efficient contemporary cottage on a small Maine lobstering island is not a common sight. For years, the couple who owns this home had a rustic seasonal cabin on Spruce Head Island that they enjoyed on weekends. 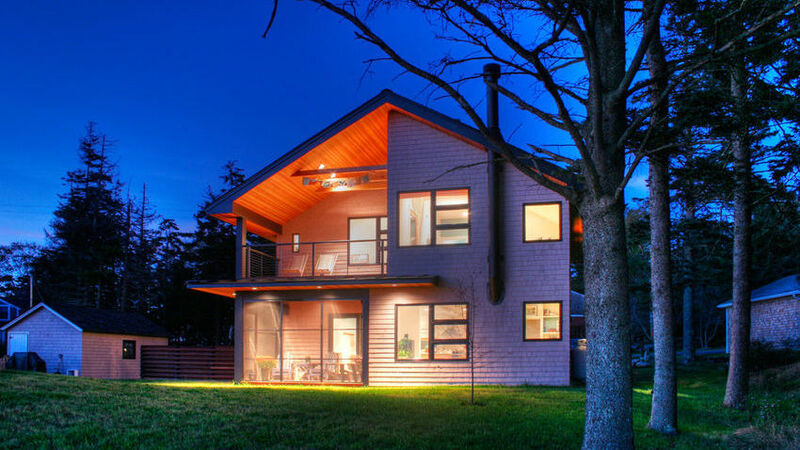 After living in nearby Rockland, they decided to build their dream year-round residence on their island property. Enter architect Carrie Shores, of Larson Shores Architects, who used to have a local practice and had become friendly with the couple as fellow business owners (the wife owns a spa in town). 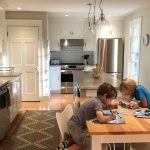 The couple’s priorities included a desire to live simply in a modest home with an open floor plan. They wanted to tread lightly on the land and create an energy-efficient home. And while they love a minimal Zen aesthetic (think Japanese teahouse), it was important to them to respect the architectural traditions of the island, which is populated by small, simple cottages. Shores worked hard to incorporate all of these factors into the home’s design. That’s interesting: The owners saved some wood from an old apple tree removed during construction to create a mantel. This is the side that faces the harbor and the islands beyond. Porches and windows were sited to take advantage of the ocean breeze. A balcony stacked atop a screened porch has a particularly spectacular view. A slatted Ipe fence creates backyard privacy while allowing the house across the street to keep its water view. “The difference in the angles of the sunlight change dramatically from summer to winter,” says Shores, who studied this carefully and sized the home’s overhangs to provide summer shade, while still allowing sunlight to make its way into the house in the winter. An important aspect of the design was respecting the local architecture. 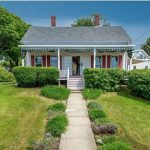 The island is full of shingled cottages, so Shores clad the home in cedar shingles that were pretreated to look weathered. The minimalist windows, black trim and roof, and uncluttered interior satisfy the clients’ love of a simple Zen lifestyle and aesthetic. In the living room, concrete floors — stained a rich brown for a mottled, leathery look — receive warmth via the winter sun and radiant heating. 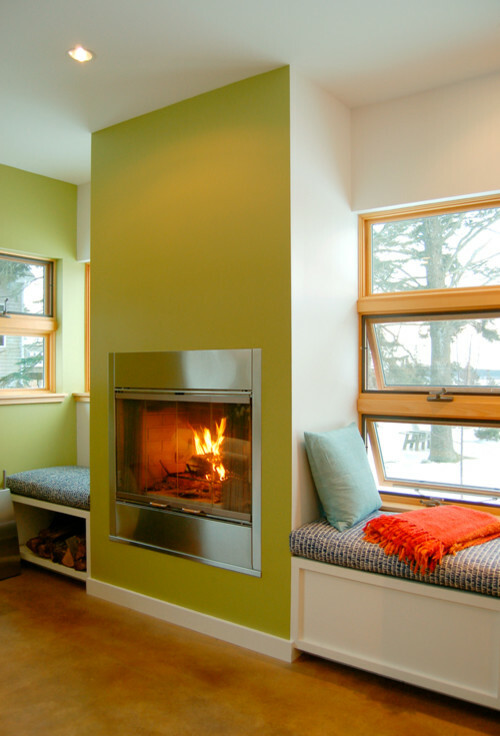 Shores placed built-in window seats in prime spots for enjoying the fire, sunlight, and view. The seats also have storage space underneath. Here, Shores used every inch she could beneath the staircase. The recess behind the table houses a dog crate. 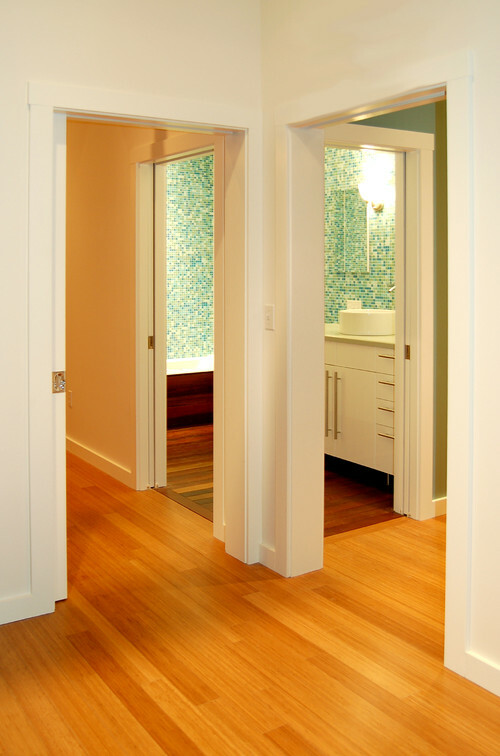 To the left, a half-bath is hidden behind a pocket door. The flooring on the stairs and the second floor is rapidly renewable bamboo. Upstairs, the floor plan consists of quadrants that have a central pivot point. There are pocket doors that remain open when the couple is home to maintain an airy feeling, and can be closed for privacy when they have company. The floor plan gives a clear idea of how the layout works within the home’s small footprint. “I worked hard to make sure the house seems larger than it is,” says Shores. “One way I did this was to force people to move from one room to another on a diagonal, and I sited windows and doors to coordinate with these diagonals.” Note, for example, the path from the entry door at the bottom right corner of the first-floor plan, through the living room, to the kitchen in the top left corner. Upstairs, you can see how the pocket doors function within the plan. This is the view from the master bedroom’s bed. 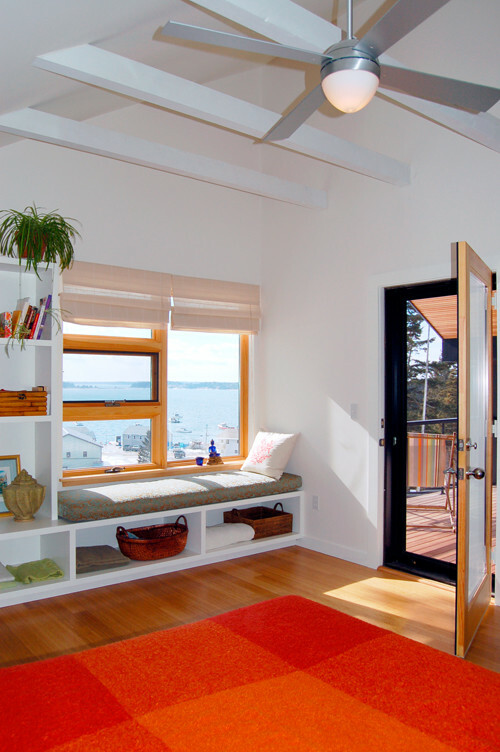 Here, there is another set of custom-designed built-ins that provide storage, display space, and seating. The door leads out to the upper porch. 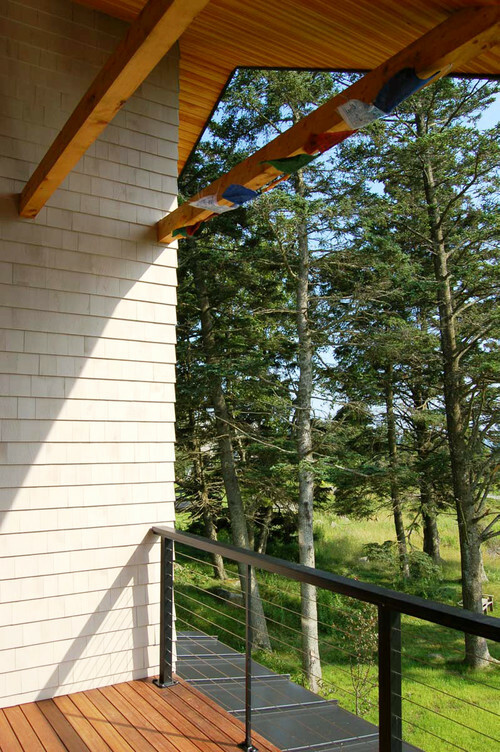 Gazing out from the upper porch, which has an Ipe floor, you feel like one of the island’s osprey, perched in a spruce tree. “We wanted to carry rich, warm wood into the bath,” says Shores. Thus, the same Ipe used outside was employed on the floor and the tub surround. 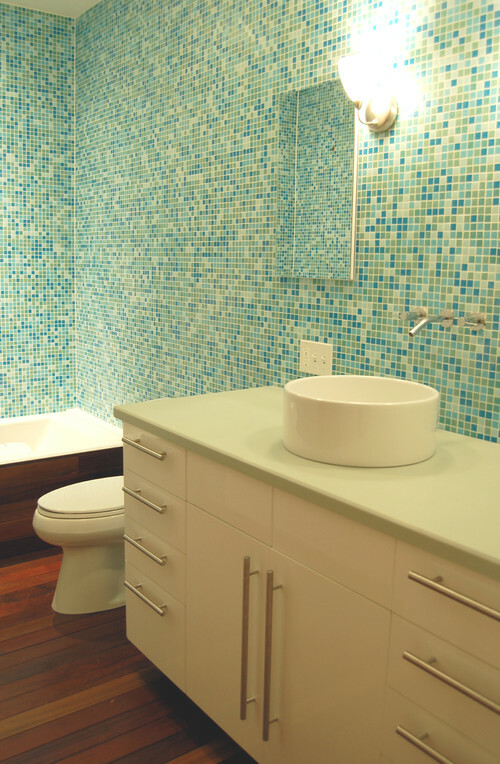 Floor-to-ceiling recycled glass-mosaic tiles make the room feel larger, as does the clean Corian countertop matched with wall-mounted faucets. Having trouble making out the house in this picture? That’s the point. 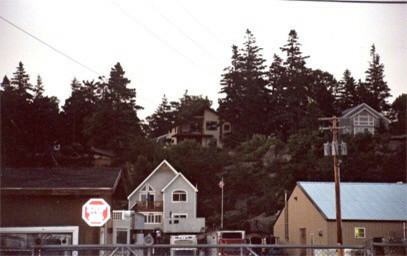 I took this while standing at sea level to show how well the exterior fits in with the other rooflines and the wooded site.